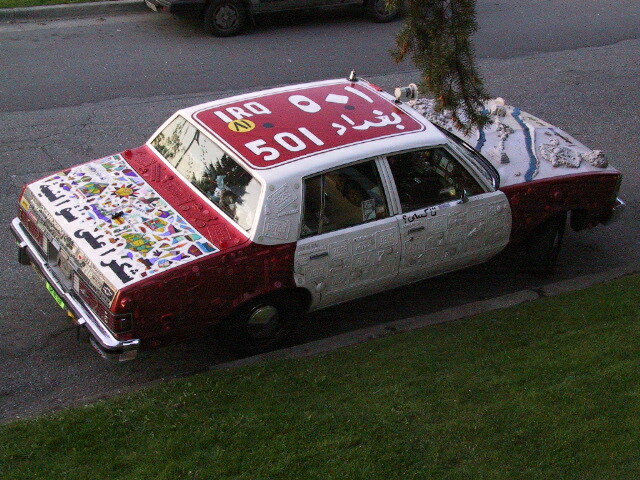 OK. Having witnessed perhaps the most staggeringly incompetent parallel park of all time by the driver of the $500K US Lamborghini Aventador above—something like a 17 point turn that took about 4 minutes, all at a roaring 90-100 decibels—I feel it’s time to share my father’s foolproof method of parallel parking. I am not sure that any set of parking guidelines would help the hapless driver of this car—or whether anything can. But I have noticed that many Vancouverites are in need of some parking tips. So this is how my father, a mathematician who liked to apply geometry to pretty much everything, taught me to parallel park when I was 16. 1. Drive a little past your target spot and pull up beside the car parked ahead of it. Make sure you are less than a foot out from that car (if you’re too far out from the car in front you won’t do a good job). Stop when your torso is level with that car’s rear wheel. This alignment is important. After this, the rest is perhaps pretty obvious. 2. When your body is lined up with that car’s rear wheel, start inching back in reverse while immediately turning the steering wheel clockwise (right) until your car is at a 45% angle to the sidewalk. This move should be done in the first foot or two of reversing (though that depends on the length of the rear of the car ahead of your spot. If it has stupid long fins, you’ll have to move back a tad farther before turning the full 45%.) Use your judgement but get into the 45% angle as fast as you can without scraping the car in front’s rear left corner. You can get surprisingly close to the car in front with this method and it feels as if you’ll scrape it but you’ll be OK. Go slowly until you have the hang of it. 3. Once at a 45% angle to the curb, reverse straight back toward the curb until the back left corner of your car is reasonably lined up with the outside front corner of the car behind you, and your back wheel is getting within 6″ of the curb. This part will feel fairly intuitive. 4. At that point, immediately turn steering wheel hard in the opposite direction of your first 45% turn—ie. counter-clockwise, or left—while inching back to move the car parallel with the sidewalk. Watch the car in front. You’ll be pretty close to it but it should be OK. Pull all the way back to within 1″ of the car behind, straighten your steering wheel and pull forward until you’re equidistant to the cars behind and in front. 5. With some practice you should be able to park within 2-4 inches of the curb every time in one go, without having to adjust back and forwards. This is a 1-point turn. Of course there’s no shame in needing to do one back and forth to get a bit closer, or even two, especially if the spot you’re inching into is really tight. NOTE: To get into any parking spot, you only need 2″ clearance front and back (far less than the several feet that the effing pink Lamborghini had on each side, and still had trouble). The only exception is when you’re trying to get into a spot between two massive vehicles, or two vehicles that are themselves really badly parked and are far out from the curb. Badly parked cars (parked way out or at an angle) make parallel parking much harder for others to park in front of or behind. Badly parked cars are also a pain in the neck for cyclists who need all the room on the road they can get. Road and Track mag offers a similar set of steps, though I think my method of alignment is easier to remember. This has been a public service announcement from my dad, who is no longer with us but whose skills live on. And for those of you roaring up and down our streets in your showy 100 decibel $500K cars or your mufflerless pricey crotch rockets, take a memo: screw you for your inconsiderateness and gaucherie. 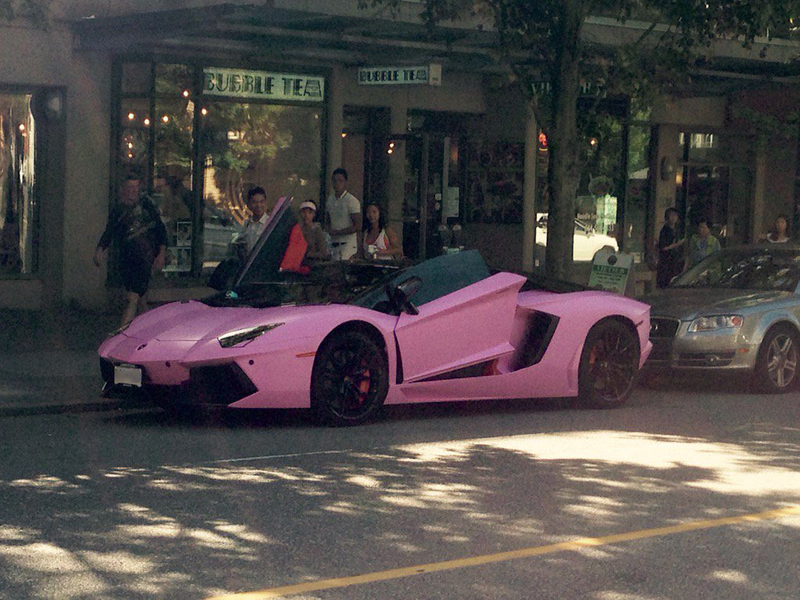 Is Vancouver not insufferable enough without your machismo and your desperate-to-be-noticed nouveau-richesse? Fix your muffler or you’ll be reported for noise by-law infractions, and next time I won’t blur out your license plate (though when one’s car is painted the queasy colour of pepto bismol a license plate is almost unnecessary, for identification purposes). Wankers. More than one person wants to key your paint job—see this twitter discussion. Note: several people have pointed out that Lamborghinis are hard to park because no visibility behind plus high performance cars are hard to steer at slow speeds. This is one reason, and the brain rattling noise is another, why you don’t effing drive them in a city, you selfish dope. This car I will let off the hook. This entry was posted on Thursday, August 18th, 2016 at 10:33 pm	and is filed under cities, cringe list, design, politics, Vancouver. You can follow any responses to this entry through the RSS 2.0 feed. You can leave a response, or trackback from your own site.